I was playing around with plying this week. 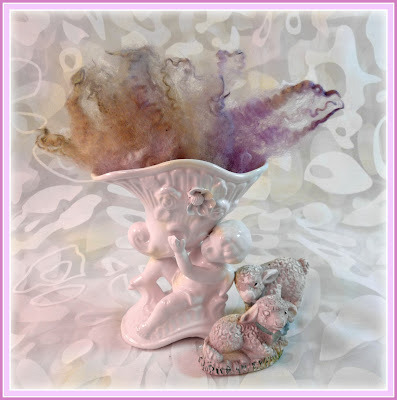 I spun up a super textured, super chunky single, chock full of locks and other goodies. Then I Navajo plied it, then I Navajo plied it AGAIN, this time in the opposite direction, and I had myself a huge strand of chunky goodness! I ended up with about 7 yards of yarn. This lariat is a little over 90 inches (2.5 yards) which makes for plenty of length to work with for different styling options. 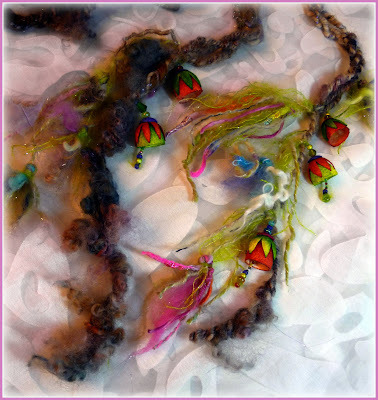 I've been thinking about different ways of using my Faerie Bells-Silk Cocoon flowers and super chunky art yarn makes the perfect lariat/skinny scarf, so why not combine the two? I dyed up this special batch of cultivated silk cocoons in sunset and moss to make the Faerie Bells, and I added some funky free form tassels/flowers. Guess what I made the tassels with? 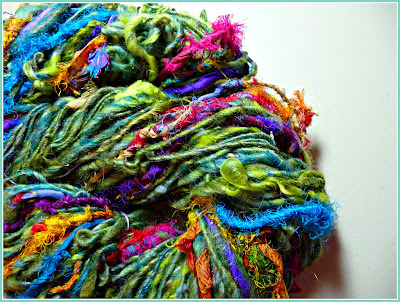 Confession time, I hoard all these little bits if stray fiber along with random chunks of handspun too pretty to toss. 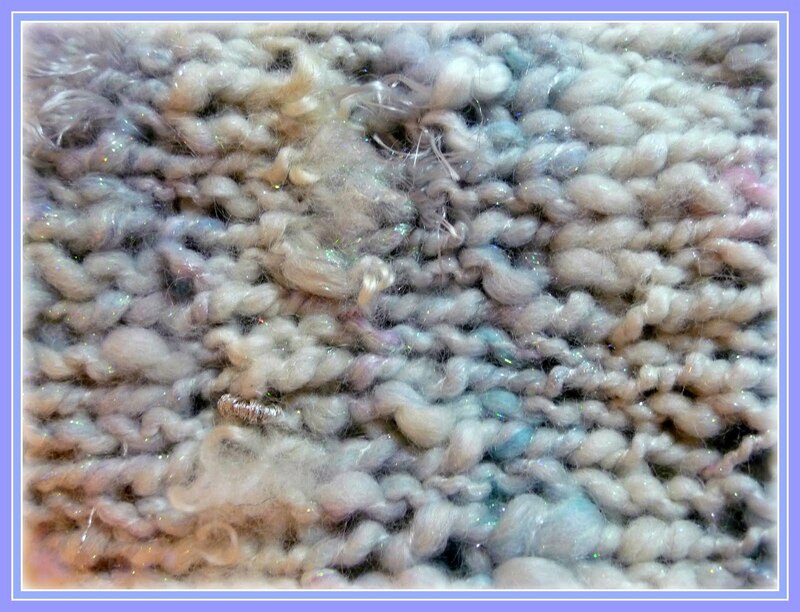 Normally I used them for felting or to add into a batt when I need more texture. I think that these wild tassels look like exotic flowers. 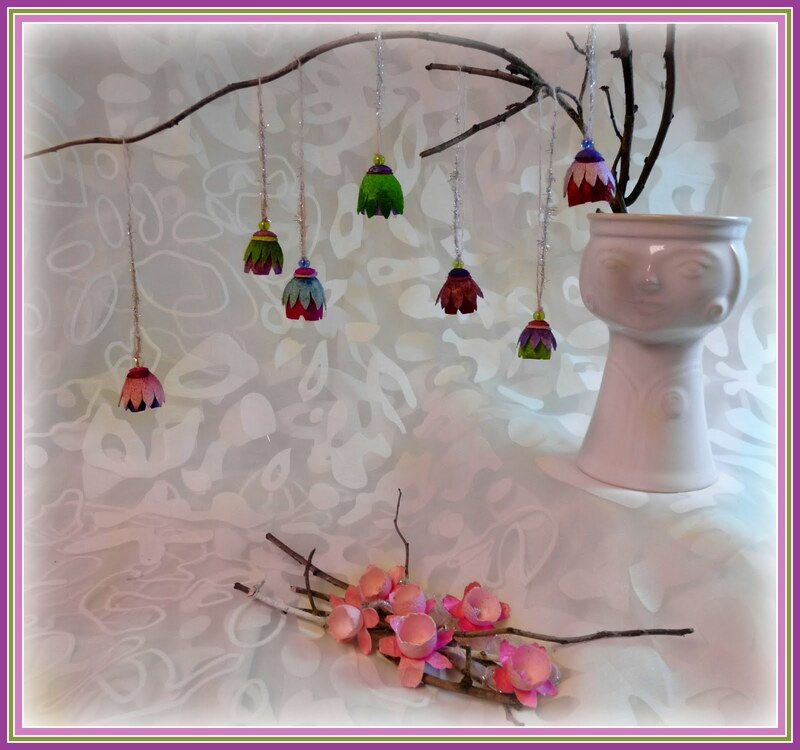 I have some pretty little charms of humming birds, honey bees and dragonflies that I think I will add...now where are they? I hope you all had a wonderful, creative week! I'm calling this skein of art yarn, LoveBuzz. Ahhh, remember how completely blissed out you become when you first fall in love? Like there's this cushion of happiness between you and the world, and even the meanest of meanies can't steal your bliss! (No wonder they say Love Wins!) All the color and texture in this yarn definitely make me and my eyes happily blissed out! 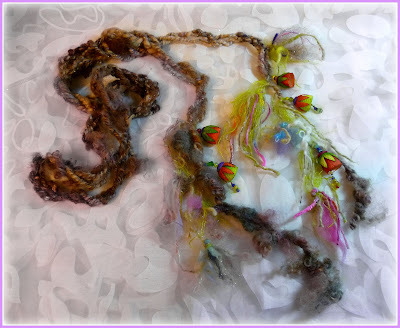 I carded up a juicy batt with an interesting color palette, added in some locks, and then spun in some lengths of sari silk ribbon. It was a great surprise when I took it off the bobbin, it really came to life! I've been working on my Cocoon art yarn technique this week too. 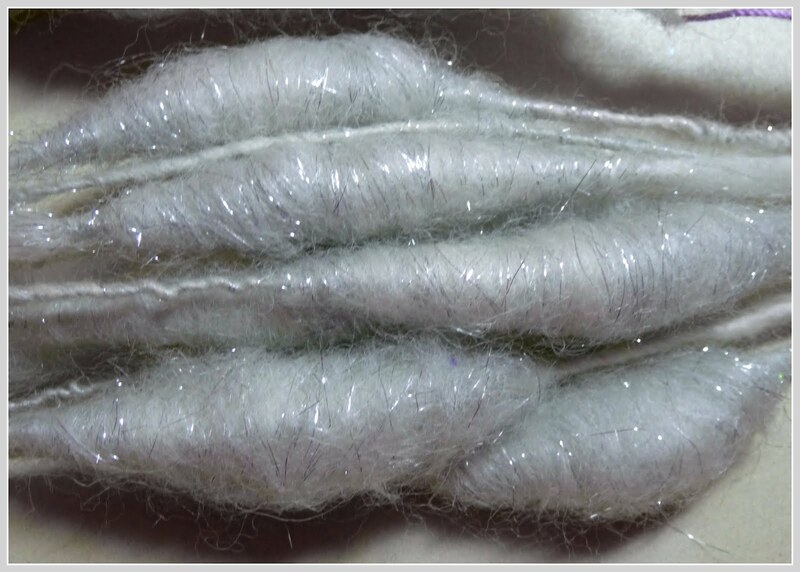 (ETA-I realize I left out the description of the cocoon technique, which is drafting fiber around a core yarn at a 90 degree angle, much like core spinning except the fiber is concentrated in one spot to create a cocoon like element fixed onto/around your yarn.) My plan was to be consistent with my size and spacing, that's coming right along, but I also need to work faster so I don't over spin my yarn. That's the fun of the art yarns and spinning in general, there's always something to work on and perfect. I was also able to scour some fleece and get it dyed this week. We've had the typical Michigan weather, one day it's like spring, the next, freezing cold. I was able to spend a little time enjoying the great outdoors during some of those spring like days. I hope you gave yourself some time this week to follow your creative muse. 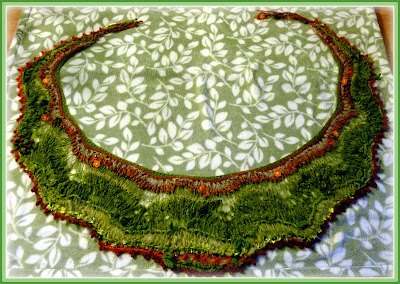 I finally finished this free range shawl (free range knitting = multiple yarns/sizes/colors knitted in combined strands and individually, changing stitches and making up the design as you knit.) and it has been safely delivered to its new home, so now, at long last, I can share pictures! I decided on a flower and vine theme and used multiple shades of green accented with pops of orange/gold and with tons of texture. Here's are some close-ups of the knitted fabric to give you a better view of how all the different fibers work together. Nearly all of the shawl is knitted in my hand spun art yarn, you can get a better feel for the different styles of yarn I used, shown here in individual strands. I even crocheted my own berry and vine yarn out of recycled cotton. 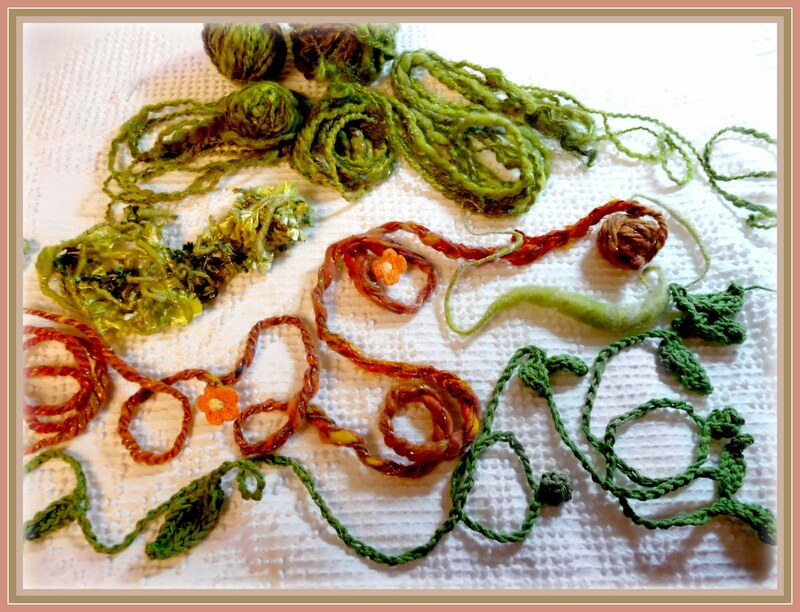 The orange yarn is a Navajo plied, super bulky, with crochet flowers spun in and gorgeous lengths of sari silk ribbons. I also used a spring green to spin a cocoon yarn. 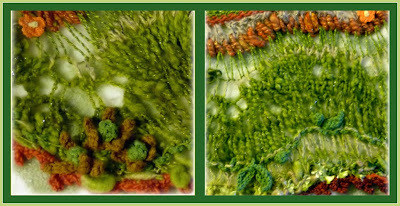 The other mossy green, which is the base yarn, has tail spun Lincoln locks and strips of batik fabric, plus lots of other goodies. I really enjoyed working on this project, I got to play with some different spinning techniques and the free spirited, make it up as you go knitting, is my favorite! 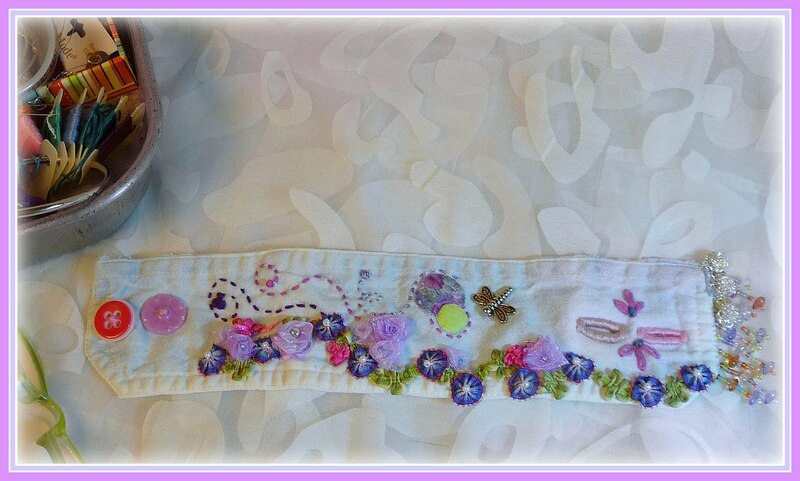 I finished the wrist cuff I started last week. I ended up changing the buttons about a hundred times, I think these really work. I crocheted some lace for the edge and then decided not to add it...the design process for me is all about try it out and take it off if it doesn't work. 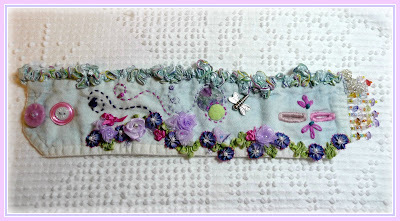 The lace is already being re-purposed in another project, so it's not wasted. During the embellishing process, I gather a palette of beads and buttons, ribbons, floss and other goodies...I end up with this ever growing tray of elements that starts off looking all neat and tidy, but by the end I have a lot of reorganizing and putting away to do! 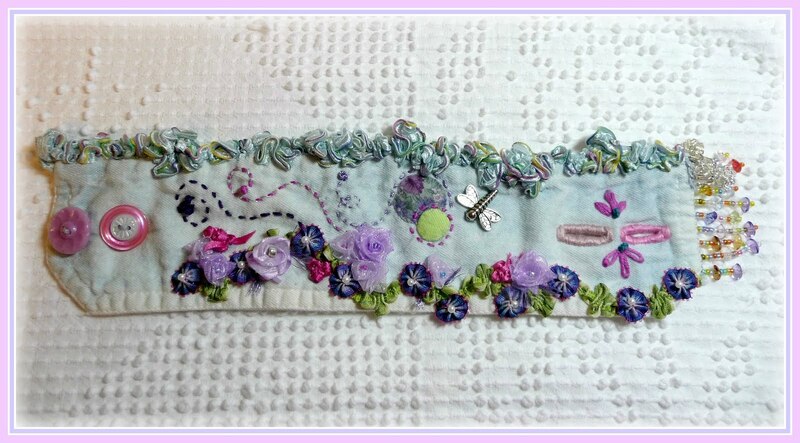 You can see the whole length here, I made the ribbon roses out of pale pink and lavender organdy, the darker bluish purple flowers are on a bit of trim I had left over from some baby booties I knit. So there's a little glimpse of what I've been up to lately, I hope you are having a creative 2012 as well! 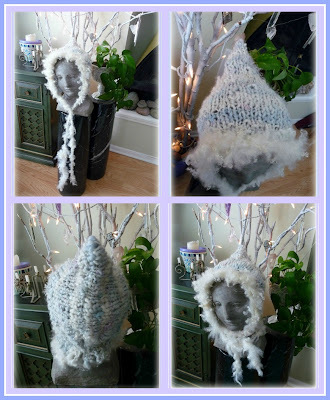 After I finished my prototype of the Winter Hood last week, I was really excited to get started on the Snow Faerie version using my hand spun Winter Wonder art yarn. Then I added a wooly ruffle and long ties made from another of my art yarns, an extreme tail spun yarn done with Wensleydale lamb locks. It's super fluffy and so cute with all the little lamb curls popping out all over. There are lamb locks spun into the Winter Wonder yarn too and I was delighted each time I saw them pop up as I knit the hood. I made sure to scoot every little pop of texture to the right side so I wouldn't lose any of those cute little curlicues. I have also been working on a new wrist cuff, this one's almost finished...so close it's hard to walk away from it, but tomorrow's another day. And if that wasn't enough I am finishing a free form capelete I've knit/crocheted using a combination of my regular hand spun and my art yarns. I love free form and I always say I'm going to spend more time working on it...maybe this is the year! I hope your 2012 is starting off with a creative burst of energy too! I'm excited to check out all the blogs this week, so many creative people and great projects to read about!